Product #20796 | SKU FA4018VDPAB | 0.0 (no ratings yet) Thanks for your rating! A high-quality stage vocal microphone with natural sound. 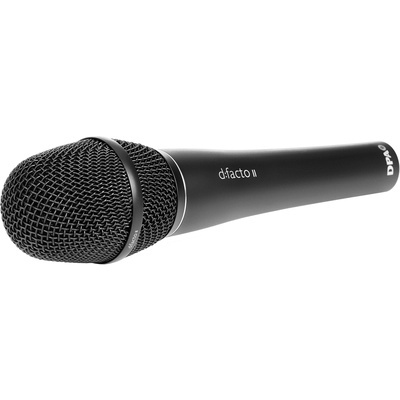 Equally at home in sound reinforcement and recording applications, the matte black d:facto II Super-Cardioid Vocal Microphone with DPA Handheld XLR Pre-Amplifier from DPA Microphones is a high-quality stage vocal microphone with natural sound, high separation from nearby sound sources, and extreme sound level handling. The microphone’s super-cardioid pattern and good definition gives high separation and true sound color on stage, equally suitable for pre-amplifier amplification and recording. A robust 3-stage pop protection grid built into the microphone removes unwanted noise. The d:facto II vocal microphone provides improved audio performance as it is linear in frequency and phase, both on- and off-axis, while its impressive definition and accuracy reproduce a singer’s voice effortlessly. You can use this microphone with Sony, Lectrosonics, Shure, Wisycom, and Sennheiser Wireless Systems with an adapter (sold separately). The flexibility of its adapter system gives you the possibilities of choosing either a wired DPA handle or the professional wireless systems with no loss of sound quality.